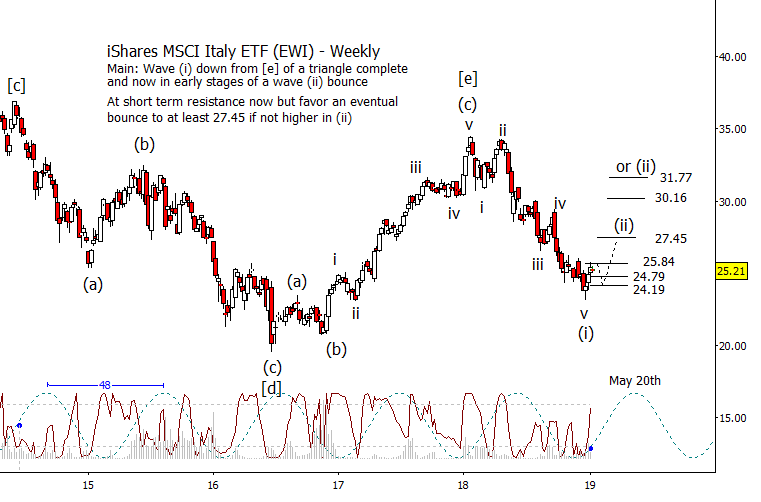 This is a quick update for readers who have been following our analysis of the iShares MSCI Italy ETF (NYSE Arca: EWI). The initial downward thrust from last year may be complete, suggesting that a sideways-upward consolidation comes next. Recall that we have been charting a range bound Elliott wave triangle in EWI for several years, and in May we pointed out that the fund appeared ready to break downward from the final leg [e] of the triangle. Our post in November showed how the bearish forecast had worked well, and it also suggested that traders should begin watching for a consolidation soon. After the November post, EWI broke still lower and established a fairly clear downward impulsive move. On the chart below, we have labeled the impulse as wave (i). Beyond 25.84, the next Fibonacci resistance levels to watch sit near 27.45, 30.16, and 31.77. Those represent the areas where EWI bears might look for another chance to get aboard. The same areas represent the places where fast-trading EWI bulls might look to close positions. Cycle timing suggests the consolidation could reach into spring 2019, with an ideal peak around May 20.